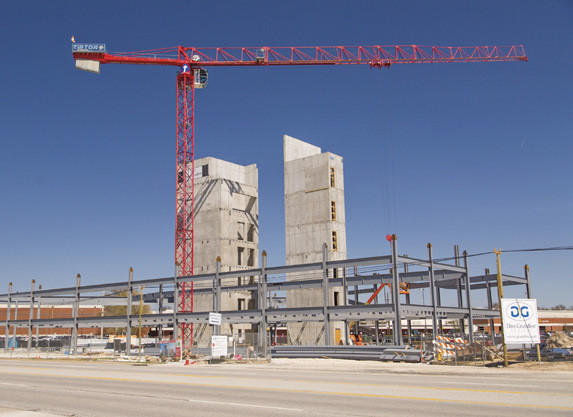 Construction of the $21 million 8W Center in Bentonville presented several challenges, including the timing of unloading materials. No, $21 million, six-story building goes up without a well- thought-out plan. When the building is under construction across the street from the corporate headquarters of Wal-Mart Stores Inc. of Bentonville, planning becomes even more important. The Dave Grundfest Co. of Little Rock realized that after it was hired to build the 8W Center at Walton Boulevard and Eighth Street. The property is owned by Troy Link, who co-owns Link Snacks Inc. of Minneapolis, the company best known for its Jack Link’s beef jerky products. Nielsen Architecture of Bentonville designed the building for developer Newmark Grubb Arkansas of North Little Rock. The challenge of the 8W Center was not the design or price tag, but the location. As one might expect, there is quite a bit of rush-hour traffic around Wal-Mart’s headquarters, and a Walmart Supercenter is nearby as well. Jeff McNeil, an executive with Grundfest who oversaw the project, said the construction schedule had to be organized to minimize complications. Further complicating the construction was the fact that the 8W Center covered almost the entire lot, so space was short for stroring building materials. “There was no room because of the roads, and the building took the entire footprint of the lot,” McNeil said. “The logistics of the location was a challenge. You know, Wal-Mart is pretty demanding, and we didn’t want to interfere with any of their access. It was a big coordination effort. The effort was a success. The 8W Center was completed earlier this year, and a Jimmy John’s sandwich shop, owned by Troy Link, has already opened on the ground floor. The 8W Center was just one of seven multimillion-dollar commercial construction projects in Bentonville in 2016. It ranked as the 17th largest in the state and was fourth among the 30 projects in Washington and Benton counties. Nabholz Construction Corp. of Conway has three Benton County projects on the 2016 list, one of which it has completed. Nabholz had 33 of the state’slargest projects, including the $98 million Arkansas Children’s Hospital in Springdale, which ranked second. In Benton County, Nabholz built the $20 million-plus 8th Street Market and Brightwater Culinary School in Bentonville, and it is finishing up on a complex that will include a $15.6 million elementary school and a $13.5 million middle school. “There is a general uptick, a good feel for what is being done in Benton County,” said Greg Fogle, president of Nabholz’s Midwest division. “It’s not record-breaking, but it is definitely noticeable. There is a lot of nice activity happening right here in Benton County, and that is enjoyable for everyone involved. Nabholz’s completed project is a combination market educational facility designed by Hufft Architects of Kansas City in Bentonville’s Market District. Northwest Arkansas Community College of Bentonville uses part of the facility for its Brightwater Culinary School, while the rest is set aside for food-related commercial stores. The culinary school opened for events this year, while the market spaces are still being developed. Bike Rack Brewing has already opened in the 8th Street Market, which probably gives culinary instructors something to look forward to at the end of the day. Fogle said Bentonville’s growth is evident across the commercial construction sectors. Nabholz doesn’t do residential or multifamily buildings — there are several such projects that made the 2016 largest projects list — but Fogle said interest is strong in retail, medical and schools. Those are usually clear indicators the region or city is growing. The schools that Nabholz is building for the city of Bentonville are the Osage Creek Elementary and Creekside Middle School. The project, 180,000 SF combined, is scheduled to be completed in time for next school year’s start in August. Fogle said the school district was determined to get its money’s worth for the $29 million initial price tag that came with the schools’ construction. Private commercial buildings can have a little more flair and ingenuity. The Brightwater-8th Street Market project was a repurposing of an old Tyson hatchery, which was a Krispy Kitchens manufacturing plant before that. Tyson used it for 33 years before closing it in 2005, and the Walton Family Foundation provided the grant that allowed the building’s reuse for NWACC. Fogle said Hufft’s design called for keeping some of the old look and feel of the facility. Fogle said the walls and structural steel weren’t painted or refurbished but left roughlooking for effect. He said it’s a modern facility that still looks like an old manufacturing plant. “It really did help preserve the history of the building,” Fogle said. McNeil said the 8W Center was a unique design for Bentonville because of the six stories, three of them are dedicated to a 185 car parking garage. The first floor is retail, the top two floors are reserved for offices while the second through fourth floors are parking. McNeil said other urban areas have incorporated this multiuse design, but since northwest Arkansas is generally roomy, it hasn’t been used in Arkansas. The crowded nature of the Wal-Mart HQ area made it a perfect plan for the 8W.